Practicing Tempo, Rhythm and Timing: The Key To Playing Better Golf! The Golf's "Holy Grail" or How Your iPhone or Android Device Can Improve Distance and Accuracy Throughout Your Golf Game; Could Obsolete Many Bunkers! Teaching pros agree that consistent tempo is an important aspect of the golf swing and a slow or erratic tempo which produces errant golf shots is something golfers of all levels should avoid. 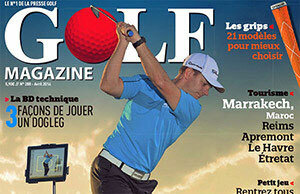 Professional golfers regularly work their tempo, rhythm and timing, so why not you? Mobile Golf Tempo training aid allows golfers to establish their best tempo, rhythm and timing in order to add length to their shots and achieve more consistency throughout their game! By simply reacting to visual, audial or vibrational signals delivered through your iPhone or Android device, you can begin your backswing, start your downswing, and impact the golf ball at precisely the correct tempo and timing. It’s just that simple! There is even an optional additional tone for golfers who utilize a swing trigger (any kind of move that takes place just before golfers start their swing) in their game. The vibrating mode is very convenient not to disturb the other golfers at the driving range. If you find that the vibration of your phone is not strong enough or is not practical, you can purchase Peterson BodyBeat Pulse Solo™. This rechargeable active clip-on device will transform all the audial signals from the Mobile Golf Tempo App into vibration to silently convey the right tempo. Just connect the standard 3.5 mm stereo plug and feel the tempo! Please refer to our blog for more information. Tempo refers to the speed of the swing (backswing and downswing until impact). Rhythm refers to the speed change during the various phases of the golf swing movement. The goal is to swing with grace. So avoid that your swing becomes a series of movements. Get the feeling smooth, not jerky. All the parts of your swing must work together in harmony. Timing is independent of rhythm and tempo; it refers to the succession of body and club movements, and that should happen in a proper sequence in order to deliver consistent results: hands → arms → shoulders/trunk → hips → legs → feet → feet → hips → shoulders/trunk → arms → hands. The "Swing Ratio" refers to the ratio of the measured time in seconds it takes to make the backswing, to the measured time in seconds it takes to make the downswing until impact. Unfortunately, everyone does not use these terms correctly. A swing ratio of 3:1 means the backswing is three times as long as the downswing. This swing ratio can vary across club selection or shot type. For example, many touring pros use a swing ratio of 3:1 for their driver with a ratio of 2.1:1 when making their putts. 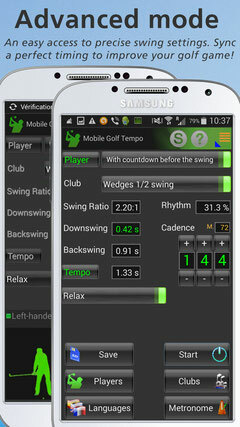 Mobile Golf Tempo training app is an effective and easy way for the tempo of the pros to take root in your swing. Any and all-level golfers can sync perfect timing in their swing. It seems that the first reference to the concept of tempo with the relationship in time between the backswing and the downswing appeared in the book “The Four Magic Moves to Winning Golf” by Joe Dante with Len Elliot, 1962. In the summer of 2000, John Novosel (“Tour Tempo: Golf's Last Secret Finally Revealed”, 2004 ) discovered a 3-to-1 ratio (noted as follows: 3.0:1) in the golf swings of the touring pro: they take 3 times as long to complete the backswing compared to the time it takes for the downswing. In doing so, John Novosel analyzed the swings of many tour players using video at 30 frames per second (1 frame = 1/30 sec). For example, he counted 21 frames for Ben Hogan’s backswing, and 7 frames for his downswing. He named this swing 21/7® which corresponds to a backswing of 0.70 sec (21 divided by 30), and a downswing of 0.23 sec (7 divided by 30). Unfortunately, analyzing videos with a frame rate as slow as 30 fps invariably induces errors (blur...) and John Novosel allows a 1 frame differential. In 2005, Dean McConnell from DXP Tech LLC has been using 60 fps video and has shown that many tour players have mostly a swing ratio between 2.25:1 and 3.25:1. In addition, for a given player, the swing ratio can vary depending on the club used (if the length of the backswing varies), but the downswing time always remains constant. In November 2006, Robert D. Grober and Jacek Cholewicki wrote a study entitled “Towards a Biomechanical Understanding of Tempo in the Golf Swing.” In an attempt to more thoroughly characterize tempo, they have performed measurements on a wide variety of golfers, from tour professionals to the average weekend golfer, using electronics embedded in the shaft of the golf club. They show that the average Pro ratio is centered at 3.0:1 and the relative insensitivity of tempo to the length of their swing or the type of club (they don’t mention but we can assume that it is only for long game). Today it is widely accepted that the perfect theoretical swing ratio for long game is 3:1, even though some Tour Pros can play very well with another ratio as well as amateur golfers. 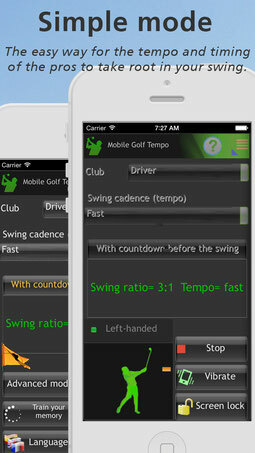 Mobile Golf Tempo has decided to let golfers choose the way that works best for them. They can change the swing ratio as well as varying it depending on the club and the type of shot (length of the backswing) even if it is not easy to memorize a swing ratio for every club. But our advice is first to try the perfect theoretical swing ratio (3:1 for long game) and allow sufficient time to practice. If you are not at ease, try another ratio. If you are unable to accelerate your backswing to be in accordance with the slow tempo (1.46 sec) and a swing ratio of 3:1, we suggest you practice with a swing ratio of 4:1 (still working with slow tempo) and gradually reduce it until you reach 3:1. Then you will be able to speed up your swing to have a Tour Pro tempo (animated or faster); your balls can only go further! To be consistent you need to respect, among other things, YOUR swing ratio, preferably close to 3:1 for long game and 2.1:1 for short game. We suggest memorizing only those 2 swing ratios. The majority of casual golfers swing much too slowly, we recommend you to swing with a tempo at least equal to 1.46 sec (corresponding to a slow tempo in the Mobile Golf Tempo Training App). 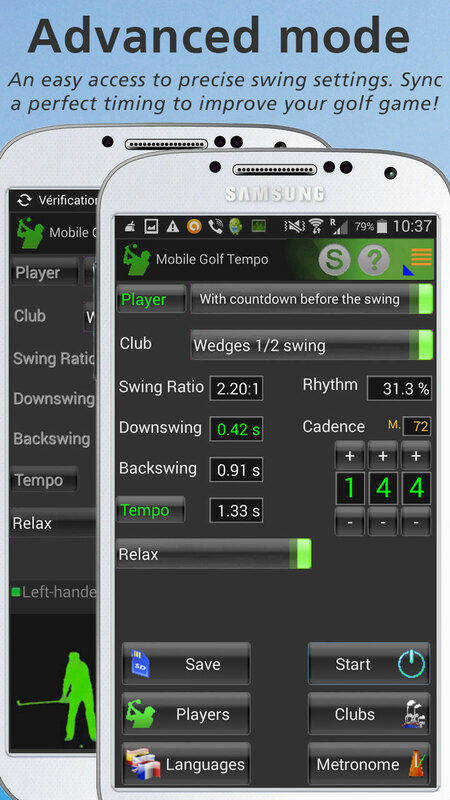 Mobile Golf Tempo Training app will emit audial or vibrational signals to tell you when you have to begin the backswing, start the downswing, and impact the golf ball. The golfer cannot react instantly to those signals; there is always a delay. This delay is what scientists call human reaction time. The human reaction time is the time that elapses between a stimulus (in our case an audial or vibrational signal) and the response to it. But when you can predict the stimulus, the reaction time can decrease to 0.1 second. The International Athletics Association Federations considers that an athlete has anticipated the gun when the reaction time is less than 0.1 seconds. Coming back to the Mobile Golf Tempo Training app, this is why you can adjust the human’s reaction time in its setup screen. When you select the option to allow an audial countdown before every swing, your brain will anticipate the tone and your reaction time will certainly be around 0.1 seconds. In the opposite case, when you select the option to allow a random pause between your swings, and without countdown, the reaction time will be approximately 0.2 seconds or 0.25 seconds if you are a woman. Therefore, Mobile Golf Tempo will add your reaction time before the first tone (takeaway) and move the second tone forward by the same reaction time to signal the beginning of the downswing. The third tone (the impact with the golf ball) stayed put since it is a timing target. Thanks to Mobile Golf Tempo training app you succeed to ingrain a Tour Pro tempo, but how to check whether it changes during a friendly golf game? You can either use the GolfSense app with a sensor attached to your glove or use the Suunto G6 watch that measures the movement of the wrist. The problem with the latter is that the swing ratio is expressed in percent and named Rhythm ( it indicates the duration of the downswing compared to the tempo). Mobile Golf tempo can convert it and you will notice that a 3:1 swing ratio is translated to 25%, 4:1 is translated to 20% and 2.1:1 is translated to 32.3%. So, two things you need to check after a bad shot: the tempo and the swing ratio. You will know, with the tempo value whether you need to speed up or slow down your swing speed in order to reach your tempo. Assuming your downswing is correct, the swing ratio will indicate whether you need to speed up or slow down your backswing in order to reach your swing ratio. For the demanding golfers, the app allows them to change all parameters of the tempo! * Offline documentation with technical advice. Check back to our Blog page often to read topics about everything from How to Build a Great Golf Swing using Mobile Golf Tempo Training App on your Mobile Device. You can follow us on twitter to receive notification when a new entry is made.